I was saddened to read of yesterday’s news story about Paul Gascoigne being detained under the Mental Health Act after an incident in a Gateshead hotel. It seems as thought the mercurial former England international footballer is never to be found far from problems or controversy. Indeed this latest report possibly shocks very few observers. Gascoigne attracts very polarised views from the public, his image is that of a troubled yet cheeky chappy. A sad clown and one who possessed a serious talent for the game of football but struggles endlessly with the more serious game of life. It would be repetitive to further relay some of the quirks, the twists and turns his life seems to have always taken. I have to confess to having been no admirer of his in the past, aside from his footballing skills. Here was a self-confessed wife-beater and alcoholic. In many lesser ways he has upset a myriad of people with his daft-as-a-brush mentality and just general ignorance. Infamously and ominously his former Newcastle United chairman in his early years as a young professional referred to him as like George Best without the brains. I wonder how hard we should be on him though? What changed my opinion about Paul Gascoigne was the last book he co-wrote, Being Gazza. I picked the book up for two pounds in a discount shop after hearing someone along the way claim it to be an interesting read. Perhaps not my usual choice in literature but worth a gamble for so little money. I found the book extremely difficult to read, not in understanding it but in its nature. I wanted to understand if there was anything I could learn from Paul Gascoigne’s experiences and observations. Now some may point to that long list and state that many other lesser-known individuals suffer from these various problems – often without diagnosis. That would be true and for me, obviously also as sad. The book goes on to chronicle many incidents and experiences which were the product of one or a combination of the many health issues above, most of these whilst Gazza flounders around trying to comprehend what is happening to him. At times he appears as an innocent child who doesn’t understand the consequences of his actions. Not in a bad or evil way but rather in an almost endearing, childlike way. I did mention that my attitude towards him had changed after reading the book. Throughout Being Gazza a constant feature are his many trips to a rehabilitation clinic in the USA. At times it seems as though this is the only place where he is able to find peace. I’m not sure how many of these long visits are known in the public domain aside from the book but I for one was surprised at the quantity and regularity of them. Gascoigne often points towards a tragic incident in his younger years when a younger boy he was detailed to look after was killed in a road accident. Paul talks of his guilt and of picking up the boy’s ‘broken body’ from the road – an image that was to haunt him through his life. Who can say how great was the psychological influence this incidence had on him, but I’d like to offer that he is a far more sensitive individual than his public persona indicates. I feel that moment in his young life may underline what has happened, and to be fair, he has allowed to happen since. His friends from back in Newcastle receive no slack at all from the public and the media. They are referred to as ‘sycophants’ and ‘hangers-on’ repeatedly and are often blamed in part for Gascoigne’s roller-coaster ride towards his demise. However, I am not sure if this is so. I believe that his well-known friend, Jimmy Gardner would have been his friend, fame and fortune or not. These friends fulfilled a need for Gazza. He never particularly wanted to leave his own people behind and was always just as happy having a few pints down the working men’s clubs back home as swaggering among the glitterati in London or elsewhere. Similarly people talk of him being ‘his own worst enemy’ and abusing and wasting his talent. When Gascoigne talks of his school days and first getting into football though his main focus always seemed to be in making money in order to support his family. I believe he stayed true to his roots in that respect and don’t believe that he threw it all away without caring. To think so shows neither compassion nor understanding of what makes the man tick. When Paul Gascoigne talks about his recent achievements or lack of them in his last book, his words are often directed towards the ill-fated short stay he had as a manager at Kettering Town Football Club. In my view it is a great shame that for whatever reason this venture did not succeed, (the cynical may say it was never going to but I’m not so sure). The one thing that the man understands is the game of football which has been his life for so long now. He seems a husk of a man without the game to focus his thoughts on. 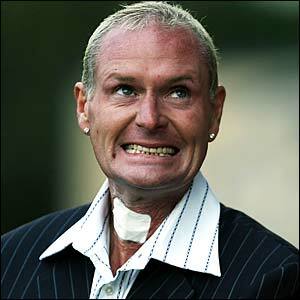 When I see Paul Gascoigne in the media these days his appearance worries me. Gone is the weight and stockiness which characterised much of his playing days. He now appears a gaunt and haunted-looking individual, a strange-looking man uncomfortable to focus on. It is so sad but his face amply belies his many troubles. So as I write, we wait for further news on his most recent incident and a report about his ‘sectioning’. No doubt the pressmen and photographers will be working hard to bring us the latest piece of harrowing news and images of this tortured and mixed-up man. They are certainly not without blame themselves for the current situation he finds himself in. In my words here I could mention some of Gascoigne’s less salubrious acts, the self destruction, the aggression and the apparent stupidity but what I truly believe is that he deserves understanding and further help. Reading into the man did change my views about him but it was what was rather between the lines than the lines themselves. Paul Gascoigne needs compassion for his has become a most difficult life to live. I wish him well whilst sadly fearing the worst. Nice piece Stu. No one should disagree with the compassion in that, but sadly there are plenty who would laugh at him now just because he once played for Rangers, or Spurs, or England, or did several things that he now regrets, or didn’t understand at the time. 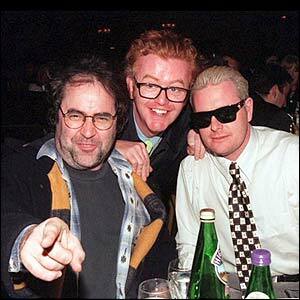 That picture of him with Baker and Evans I always find chilling and repugnant. Why anyone would think it a good idea to spend time with those revolting self-indulgent egotists I don’t know. Sometimes Gazza reminds me of Michael Jackson, blessed with a talent that offers him the only refuge from the curse of the wealth and fame that it has brought him. Both of them now seem unable to exercise that escape route, leaving them trapped in a nightmare world built around them by media, sycophants and parasites. I have sometimes wondered whether Gazza’s best hope for a life after football was in working as a kind of skills coach for young kids, where he could use his fantastic ability to enthuse and inspire new generations of players. Sadly I think his personal problems would now prevent him being entrusted with that kind of responsibility. Like you I fear this latest episode is only the beginning of a long torment. Glad you agree because I just don’t really share all this hatred because of his ‘hun’ days. I chose that pic of him with Evans and Baker carefully. I share your disquiet about those two. That’s a pretty good analogy with Michael Jackson in some ways. I also agree that this man would be wonderful working with kids but as you say, it’s unlikely that will ever happen. Sad. You’re not wrong there, Stuart. Unfortunately I wodner if people are going to now remember him for all the wrong reasons?